BPS Khanpur 107 Staff Nurse Final Result 2017 - BPS Khanpur Govt. 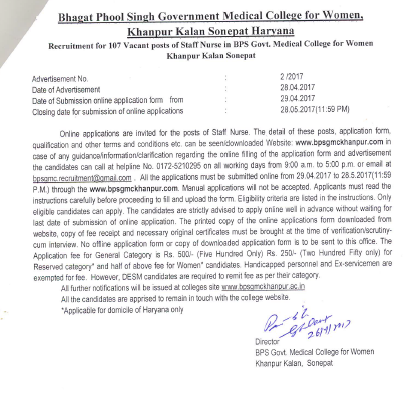 Medical College Staff Nurse Recruitment 2017 107 Vacancies Apply Online - BPS Khanpur Staff Nurse Recruitment 2017 – Bhagat Phool Singh Govt. Medical College Khanpur Staff Nurse Call Letter 2017 - www.bpsgmckhanpur.com. The good news is that BPS Khanpur has uploaded the result/merit list for the posts of Staff Nurse on official website. The interview date has been uploaded with this result and interview has been scheduled to be held on 08th to 10th August 2017. The interview venue, date & time has been mentioned in the result/scorecard of the candidate. Bhagat Phool Singh (BPS) Government Medical College had released notification and invited from 29th April to 28th May 2017 applications for posts of Staff Nurse. The selection process will be made through Exam. BPS Khanpur is working on uploading online admit card for the examination which is expected to be held in August/ September 2017 at various Exam centers for the posts of Staff Nurse. Those candidates who had applied for these posts and waiting for their BPS Staff Nurse Call letter 2017;they can download it from direct link given at the end of the page. The latest & fastest news is that BPS Govt. College has uploaded interview call letters for the shortisted candidates. The candidates can download their BPS Staff Nurse interview call letter now on the official website. Earlier the candidates are shorted on the basis of marks obtained in the point obtained in the pre-merit list. The candidates must bring their all original documents in the interview session. No candidate will be allowed to attend the interview without interview call letter, application number and original documents. · Go to official website www.bpsgmckhanpur.com. · Click on registration link. Then click on OK button. · Read all the instructions before applying online. · Click on continue to registration and proceed buttons. · Enter your details such as name, gender, email etc. · Click on registration button and note down registration number. · Login your account and enter login ID and password. Click on sign in button. · Upload documents in prescribed sizes.